Beyond our travels to source wines directly we rely heavily on our strong relationships with wine agents in the province. Much like celebrities and athletes, each wine (or winery) requires an agent in the province for representation. The agencies provide another source of expertise and are able to find a vast array of additional wines. Working in partnership with key agencies, we rely on them as an indispensable resource for finding unique, exclusive and hard to find parcels from around the globe. It’s not uncommon to see at least one agent, and often many more, on a daily basis stopping by our Head Office to meet with our Buyer and provide samples for the buying team to review. These wines might be new to the market or samples direct from a winery that might turn into our next top seller! Once a week, the buying team reviews the wines that were submitted. They review quality, region, price, availability and any awards or accolades the wines may have. Every year we sample thousands of wines but only the best are chosen. We spend an incredible amount of time filtering through all the submissions to find the gems!Typically for every few cases of wines that are presented only a couple will make the cut. Our buying team works very hard to make sure only the best wines find their way into our stores and online. Beyond our weekly tasting our buying team conducts comprehensive blind tastings three times per year in an effort to source incredible values for upcoming seasons which are typically categorized by Winter/Spring, Summer/Fall and of course, Christmas! Our buying team enlists the resources of our agents to find and present seasonal samples which we panel taste with key staff approximately 6 months ahead of the season! 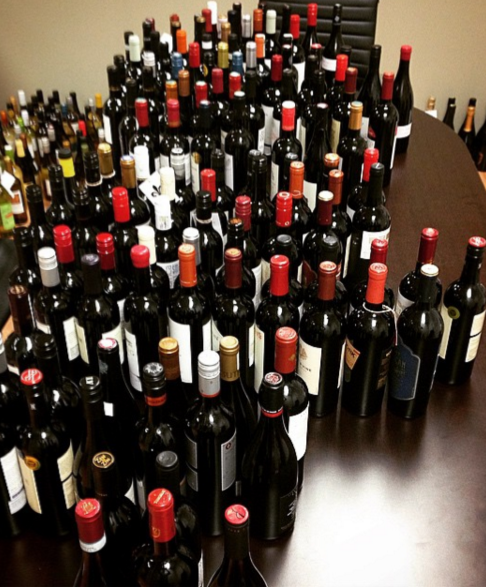 It’s not uncommon that a panel of 8-10 employees a day will taste over 500 wines in a week! We enlist the help of a broad spectrum of palates from head office employees to managers, sommeliers and cashiers. During these mass blind tastings the buying team gathers and records feedback from the panel. The buying team then compiles a list of the top wines based on price and quality at all levels! It’s a rigorous and exhausting process but ensures we find the best values at all times throughout the year! - BC Wine Institute’s bi-annual Trade Tastings which provide a comprehensive look at our incredible BC wines! - Napa, Sonoma, Bordeaux, Australia, Chile, Argentina, France, Italy among dozens of others! Just some of the many reasons we're your #1 destination to shop for the BEST selection of wines in British Columbia! Visit any of our stores or search online to see for yourself!